One of the very best ways to kick-start your career in web development, or to energize a career that’s started to run out of steam, is to find work with a web development company. Web development companies are focused on web development as their only job. This has all sorts of implications, mostly good, for the job you’ll be doing and for your career going forward. In a web development company, you probably won’t do much but web work, and you’ll do a lot of it in a short period of time, hopefully to a high level of expertise — supported by other awesome professionals like yourself. Oddly, web development work often doesn’t pay all that well. In a web development company, you might experience the joy of being billed out to a client for a princely (or princessly) sum such as $1,000 a day, and seeing about 20 percent of that amount in your paycheck after deductions. Also, the client rules the roost. Web services companies live and die on their clients’ happiness, so, at the end of the day, the customer is always right. The good web service companies have rules, procedures, and structure that keep the client at least somewhat in line, or get a lot more money from them if they keep moving the goalposts during a project. A bad web services company tries to make up for its own missed deadlines and its clients’ flightiness by sweating its assets — which means trying to get more work out of you without paying you any more money. In a web services company, you’ll work very hard, for relatively little money, but with brilliant people. You’ll use the latest technology and be paid to live on the cutting edge. Your later career will benefit many times over from even a few years spent at a web services company. Pros: Varied and interesting work. Latest technologies. Lots of travel. Bright, hardworking people. Respect from (the better) clients and peers in web development jobs. Cons: Long hours. Pay on the low side, demands on the high side. Lots of travel. The client is king. Salary: Often low for the role and responsibilities, and bordering on a minimum wage violation when you consider the number of hours you’re likely to work. Benefits: Often solid, if the company is well-established. Career path: Get underpaid working for a web services company for a few years, then get overpaid to work half as hard, for twice the money, from a non-web services company that will be dead impressed by your background. Web services companies are often pressure cookers. They’re great places to have worked for, and difficult places to actually work. 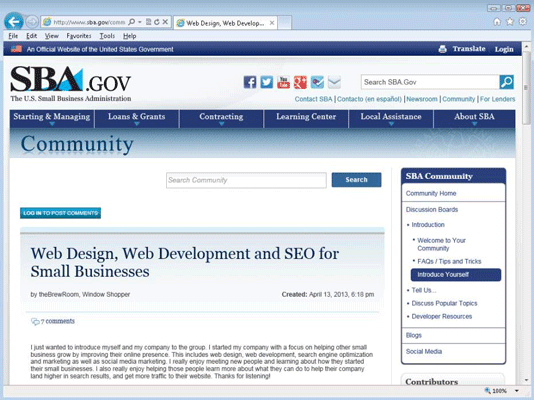 Here’s a promotional blurb put on the Small Business Administration (SBA) site for a web services company. You can see that this company is a generalist firm without any one strong technological edge; the focus is helping small businesses. Other web development companies have any number of specialties.